Which driver should you be playing? You know they’re both packed with technology and PGA Tour players are winning with both. We’re here to give you our take to make sure you’re playing with the right driver. So let’s dive in and tell you what the difference is between the TaylorMade AeroBurner driver and the TaylorMade R15 driver. The faster you can swing the club, the greater amount of force you can generate and therefore the golf ball will travel faster and further. That’s the premise for the TaylorMade AeroBurner driver. 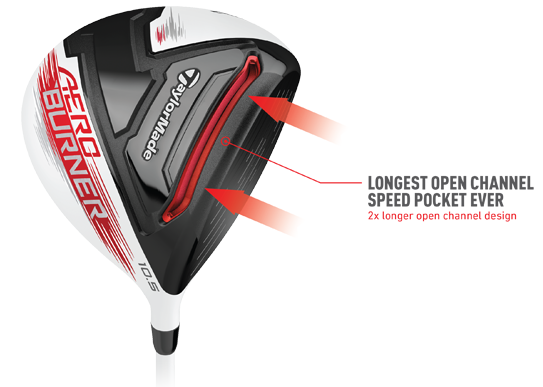 TaylorMade achieved a faster driver through three key technologies, an AeroHosel, a raised crown, and an improved SpeedPocket. The AeroHosel is is a “fin” located near the heel and hosel which allows the club to cut through wind resistance with ease. The new raised crown height design also features a rounded toe which aids with the reduction of drag during the golf swing. The third key technology is the improved SpeedPocket design. The SpeedPocket now covers more of the sole (toe to heel) because the Loft Sleeve is no longer needed on the AeroBurner driver. The improved SpeedPocket is larger than ever and creates more consistent ball speeds across the face, especially on off-center hits. All of these technologies will allow you to swing the AeroBurner driver with some of the fastest swing speeds you’ve ever had. You’ll love this club if you’re looking for more distance and forgiveness without the confusion of having to make any adjustments to the driver. Just pick up the driver and let it rip! For players looking for a high performance adjustable driver, the TaylorMade R15 driver is your weapon. It features technologies geared to the golfer who wants to fine tune their driver. 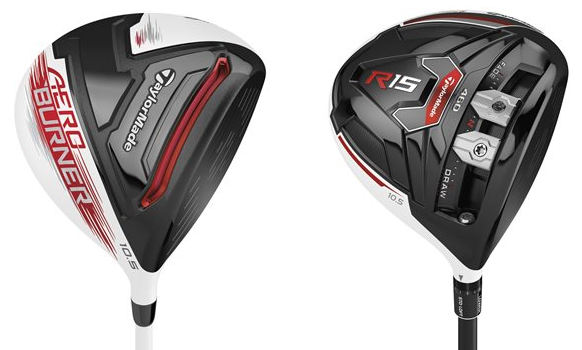 The Front Track system in the R15 driver has been moved closer to the clubface, compared to the SLDR, by 12mm, which shifted 75% of the total driver’s weight to the front of the club head. 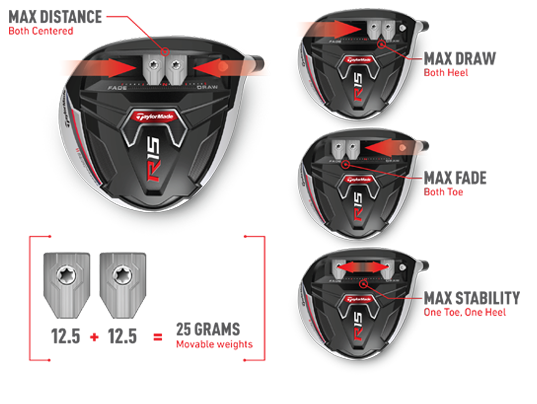 This re-positioned weight design has produced a driver with the lowest and most forward center of gravity (CG) ever. Due to the lower CG position in the R15, the initial launch angle is will be higher with much lower spin rates. You’ll still need to increase your loft, but not as much that was needed for the TaylorMade SLDR driver. TaylorMade has considerably improved the playability of the R15 driver by adding an additional adjustable weight in the Front Track system, each weighing 12.5 grams. These weights allow you to adjust a wider range of shot dispersion and help create a more forgiving driver. With two adjustable weights, you’ll now have the option to make the club more forgiving, more draw bias or more fade bias by moving the weights accordingly. You can also make a combination of these adjustment, for example you can move one weight towards the toe and one weight towards the center and you would have the R15 driver set up for a slightly more forgiving, minimally fade-bias club. Check out our popular TaylorMade posts: R15 vs SLDR, What’s the Difference: SLDR, SLDR S, SLDR S Mini, JetSpeed vs RBZ Stage 2, SpeedBlade vs RocketBladez, SLDR vs SpeedBlade, JetSpeed vs SLDR, You Decide: TaylorMade 2017 Irons – M1 or M2, Shape It or Bomb It: TaylorMade 2017 Drivers – M1 vs M2, M Battle: 2016 TaylorMade M2 vs. 2017 TaylorMade M2.